Niyoki began performing at age five with her piano-playing mother, father, brother, and older sister in the White Family and remained with the group through high school. Her two younger sisters later joined the group which recorded five albums, and toured the Midwest and Southeast on weekends and during the summer. The sisters began singing backgrounds for Prince as well as opening his shows with a 30-minute set of their own. They appeared on his 2001 duet with Angie Stone, “U Make My Sun Shine,” and on his 2003 CD The Rainbow Children on which Niyoki was briefly featured singing second lead on the song “Everywhere.” A Milenia CD titled Our Story was issued in 2005, and included two Prince-produced tracks. "My Everything" (2006) was the answer to Niyoki’s prayers. Covering a broad spectrum of styles, Niyoki makes her way through smooth R&B, infectious dance tracks, and pure soaring gospel in her debut CD. 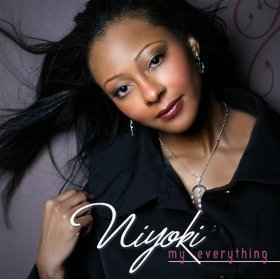 The CD has sold 15,000 copies since its release in 2006 and the lead track, “He’s Here,” was named the 27th most-played gospel song of 2007 by the trade publication R&R (Radio and Records).” That is awesome for a new artist on an independent label,” Niyoki says. The songs on the album touch on issues such as preparing ourselves for Christ’s return, getting back in touch with our faith no matter where we are in our Christian walk and knowing that we are all worthy of Christ’s love. The spiritually uplifting, musically inventive follow-up to her acclaimed "My Everything" was "Rest", released in August of 2008. Although Rest has, in the singer’s words, “a central theme of hope and love for Jesus Christ,” the CD offers a diverse menu of musical flavors, from the traditional gospel of “Never Gave Up,” on which Niyoki stunningly navigates four key modulations, to the praise-and-worship sounds of “Come In,” the sweetly harmonized “I Will Rest,” the dance floor-friendly “Joy,” the hip-hop-infused “He’s Chosen Me,” and the rock ‘n’ roll of “I Win.” And on her reprise of the ballad “So Glad You Decided,” Niyoki sings alone, without instrumental accompaniment, showcasing the strength of her voice, as well as her remarkable contralto-to-mezzo-soprano range. Niyoki’s music is joyful, hopeful and inspirational, capturing the essence of what it means to be unafraid of facing the toughest tests life has to offer and unwilling to stop at anything short of triumph.